sustainabletrentu | Advocating for sustainability and environmental justice. Sustainable Trent condemns the recent announcements by the Ford government to cut free tuition for low-income students, decrease tuition costs by 10%, and implement the “Student Choice Initiative.” These cuts and “choices” will reduce university budgets as well as funds reaching important organizations doing critical work on campuses across Ontario, negatively impacting student services and opportunities for learning and personal growth. Sustainable Trent views these announcements as a direct attack on student democracy. Numerous Trent organizations providing essential services and opportunities for students are funded by student levies. These levies, both refundable and non-refundable, have been supported by Trent students through the democratic referendum process. This proposal would override these decisions made by students and would represent a complete disregard for and disrespect of these decisions and the importance of student democracy. Extracurricular opportunities are an essential part of the university experience; volunteering and learning through these organizations is how many students are able to explore and develop their interests and build transferable skills before entering the workforce. These activities also represent an important social space for students, ensuring that the stress of courses does not become as overwhelming. If these opportunities are reduced, or cut entirely, student experiences will be negatively impacted. Similarly, many of these organizations employ students in work-study positions which will be drastically impacted by both the Student Choice Initiative and the cuts to OSAP. This will both reduce the financial stability of many students and negatively impact the competitiveness of resumes of Ontario-educated students. Overall, Sustainable Trent believes that these proposed cuts are a form of oppression, negatively impacting vulnerable populations’ opportunities for education and skills development. These cuts cannot be supported. As students dependent on these services and opportunities, we can resist and show the Ford government that we will not sit passively and accept these damaging cuts. We saved the Greenbelt, we are working to save freshwater, and we can save OSAP and student services. Exploration Following his keynote address, Charles Hopkins will lead this workshop which will engage participants in discussions of what could, should and is being done to create an effective response from higher education. Examples of issues that could be raised and considered include: “Should Higher Education even become a tool in implementing national policy?” and “What additional undertakings could be done to build upon the current successes of Greening the Campus?” The issues and the discussion will arise from the participants and Hopkins will share observations from his international engagements. The workshop format will be a participatory exploration of crucial philosophical and practical questions concluding with a compilation of answers/suggestions for both personal and institutional consideration and action. Caregiver Burnout and Sustainability – Fleming College Caregiver burnout is a term used in the medical field to describe various symptoms from over stress including apathy, insomnia, low concentration, and poor performance. However, caregiver burnout is becoming prevalent in sustainability careers. Using writing exercises, role-playing, and creativity, this workshop will supply participants with tools and techniques to combat over-stress in the environmental field, and build a positive, productive attitude. strategies to decolonizing your environmental perspective and approach. work together, bringing new perspectives to sustainability work by including the best of multiple knowledge systems. Reducing your personal greenhouse gases What is the difference between a kilowatt and a kilowatt-hour? Did you know that residences are the major source of greenhouse gases in Peterborough? Is it better to replace all my light bulbs with LED’s or to turn the apartment temperature down 1 degree? How much difference does it make if I take a bus or drive a car? This workshop will give enough basic knowledge (also provided in a handout) to make these decisions. You will then work in pairs or small groups to determine how best to reduce your personal greenhouse gases. Bring pencil, paper, a calculator and the desire to help the planet. 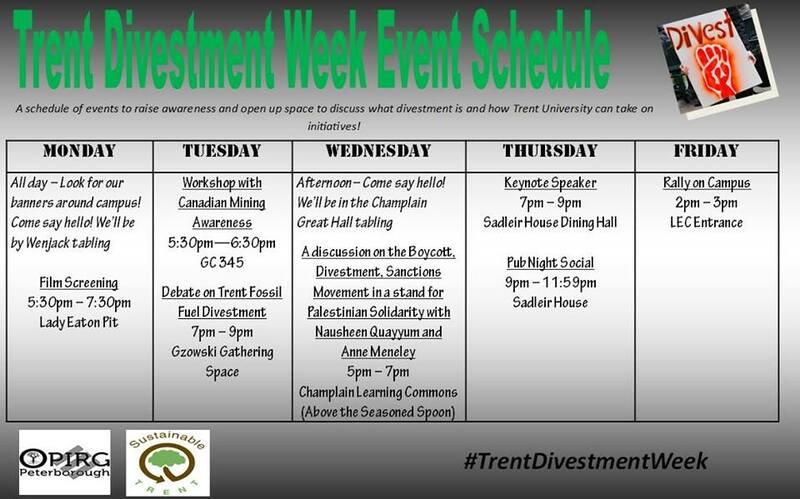 Divestment and Re-investment at Trent University and beyond Interested in learning about the divestment campaign at Trent? In this informal workshop we will talk about the past and present divestment campaigns at Trent, the national divestment movement, and how students can learn more and get involved. There will be lots of time for question and answer. Garden TOUR Come along for a walking tour to Trent’s very own rooftop gardens. They grow food for our on campus, student-run cafe the Seasoned Spoon. There’s a great view of the campus from the gardens! What They Do at Waterloo: U. of Waterloo Campus Sustainability Initiatives Come learn from students all the way from University of Waterloo who will be sharing their experiences about the barriers and successes of creating a sustainable campus. The will discuss their goals, how we have achieved them on at Waterloo campus and the resources they’ve used/how they go about funding/planning and structuring environmentally driven programs on campus. Bringing Climate Justice to Campus Activism Fatin is here with us from Toronto, Ontario where he is a Studio Y Fellow at the MaRS Discovery District. Workshop topic: The Paris Climate Agreement at the end of 2015 gave a resounding global call for a phase out of fossil fuels and accelerate our transition into a clean energy economy. This workshop will track the climate justice movement in the last few years through multimedia and personal narratives. We will discuss how to incorporate anti-oppression frameworks, intersectionality, and indigenous solidarity into climate activism. How can you engage with climate justice in a meaningful and impactful way ? The Rotten Reality of Food Waste & Climate Change “Food connects us each and every one of us. It is the source of life, after all! But have you ever wondered what happens to the food that does not make it to the grocery store, or that you scrape off your plate? This workshop will look at how food waste comes to exist and the damage it is doing to our planet. Through hands-on activities we will get creative (and maybe dirty) in exploring how we can each reduce the food waste in our food system, stores, schools and homes.” In this workshop will explore how we use youth engagement, popular education and anti-oppressive models to engage our community on environmental topics and in our workshops. The Seeds for Justice Facilitators Collective peer-to-peer model encourages dialogue and an understanding of both local and global issues while inspiring hope and change! Campus Food Production: the Trent Market Garden This worshop discusses on-campus food production at Trent, focusing on our on-campus Market Garden as a case study. Presenters will discuss the project’s first production year, barriers encountered so far, and plans for this upcoming growing season. This case study will be framed within a larger discussion of campus and community gardens across Canada. Student Strategies for Creating Sustainable Campus Food Systems This workshop will encourage participants to be creative and use art materials to map and/or draw what they are talking about. We will bring these all together to serve as a visual record of our efforts. The presentation will talk about the WHAT of campus food system change at Trent since 2012 (new contract, actual changes thus far). The WHO of campus food system change (actors and their roles). The HOW and WHEN of change – political opportunity structures and policy windows, framing issues and perseverance. The WHY is likely self-evident but I will touch on some key points, and critique the assumption that “local food is good food” with reference to scale having no inherent qualities. Re-Investment Trent As support for the divestment movement continues to grow nationally and internationally, many are considering an important question: Where will institutions re-invest their divested funds? In this panel, speakers will discuss the possibilities that they envision for re-investment at Trent. Fleming College Sustainability – Frost Campus This workshop will highlight the current sustainability initiatives that Fleming’s Frost Campus implements. This includes the Green Roof, Living Wall, Butterfly Garden/Xeriscaping, Community Garden, Bike Loan Program, Free Market, Waste Strategy, Vermicomposting, Wind turbine, Geothermal heating, Frost Organic garden and the New Technology Wing in general. We will follow this overview with what specifically our program (Ecosystem Management Technology) has been doing with regards to future sustainability practices. Specifically, we will highlight our annual conference we organize, a platform for community members to come together and discuss a differing environmental issue each year. The session will end with a question period talking about how other campuses might implement similar initiatives and how sustainable campus initiatives might be further improved upon. Trent University’s Board of Governors has rejected fossil fuel divestment after more than a year of deliberation. 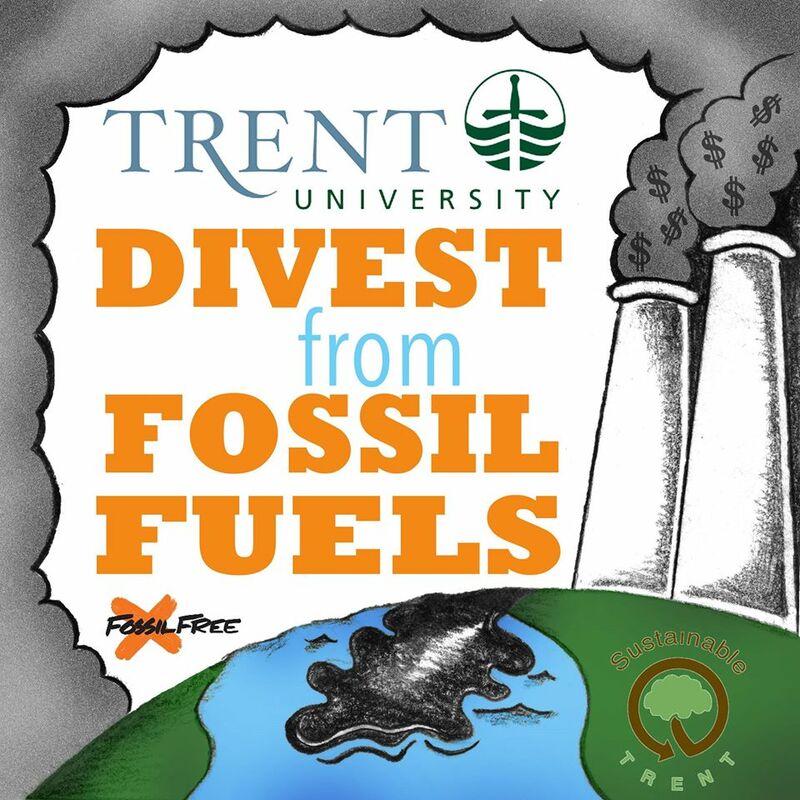 On May 8 2015, the Board of Governors, led by the Investment and Pension Committee, announced that the university will not divest from fossil fuels after a “careful” review of the proposal, including recommendations from Sustainable Trent. Trent will continue to invest in coal, oil and gas companies while catastrophic climate change looms closer, pipelines rupture, oil-burdened trains explode, and the tar sands continue to encroach on Indigenous lands. While fossil fuel companies poison the air we breathe and contaminate our waters, pumping CO2 into the air while climate change rages onward, Trent thinks it’s reasonable to keep supporting these corporations through its investments. The membership of Sustainable Trent is extremely disappointed by the Board’s decision to not pursue divestment from fossil fuels, as doing so would have been both the moral and financially responsible thing to do. By continuing its investment in fossil fuels, Trent is continuing to profit off of climate change, oil spills, human and Indigenous rights violations, and environmental destruction. Trent is also making itself vulnerable to the carbon bubble, and risks losing money on its investments. This decision comes despite the wide support of the Trent community. Trent students voted for divestment by a wide majority of 76% in the 2013 student elections. The Board’s decision ignores the over 1300 people who signed a petition calling on Trent to divest, and the over 50 faculty who signed an open letter urging divestment. Numerous organizations also supported Sustainable Trent’s campaign, such as CUPE Local 3908 and the Trent Central Student Association. The Board’s failure to heed student voices and take a democratic approach demonstrates that Trent students cannot count on the BOG to act in their best interests. Sustainable Trent acknowledges that establishing an endowment category for responsible investments is a baby step in the right direction. The positive thing about this approach is that socially responsible investing can consider a lot more than just fossil fuel companies – it deals with all kinds of ethical issues ranging from human rights to environmental protection. We would be more impressed if Trent decided to invest the entire endowment fund according to responsible investment principles. That at least would be a bolder move. We would be even more impressed if Trent made this move AND embarked on divestment from fossil fuels. That would be easy since fossil fuel investments are by nature socially irresponsible. But a mere 10% of the endowment is not a change to the status quo. It sounds more like the appearance of an ethical stance than a true effort to change how the university invests its money. Trent has missed out on an opportunity to be a strong leader in environmental sustainability and social justice among universities in Canada. Concordia University recently set a precedent by becoming the first university in Canada to partially divest from fossil fuels, committing to divesting $5 million out of its $130 million endowment. Trent could have one-upped Concordia by showing more bold leadership and divesting its full endowment fund. The membership of Sustainable Trent will keep pushing until the Board of Governors and Investment and Pension Committee commit to full divestment from fossil fuels. We do not accept this decision to invest in companies that are actively destroying the land and the future of the Trent’s own students.